What gets a bit confusing is that there’s a fair bit of overlap between Yammer (a recent acquisition) and the out of the box SharePoint social functionality. That overlap hasn’t quite been rationalized as of yet, and is the topic of much speculation. For now, note that there is a quarterly refresh of the roadmap for Yammer and SharePoint (link to the last one), and if you’re reading this post more than a couple months after it was made, it’s probably out of date due to the continuing convergence of the two investments. This post isn’t intended to cover the differences between the two, as that topic has been extensively covered in other blog posts. Instead, this post has me putting on my project and program manager hat and reviewing a couple of use cases in which Yammer could make my life a lot easier. One particular use case is that I can extend my Yammer network to include team members that are outside of my corporate network and who don’t have access to the SharePoint site. This provides an easy collaboration platform to augment the SharePoint site and Project Server. Additionally, Yammer has a much larger presence in the mobile world, which means I can now participate in the project discussion easily from my mobile device. This leads to one of the key elements in Project Server that, in my opinion, has been lacking for the last couple versions. Specifically, Project Server has long had a gap in capturing the project narrative, the human story behind the status reports and the projects. Yammer seems to be a great method of capturing and surfacing the narrative – and supporting the kind of asynchronous collaboration common to distributed project teams today. This also augments the onboarding process as team members may join the team and quickly get caught up on the major discussions. Think about how you can augment your requirements clarification discussions with specific hashtags for the requirement. 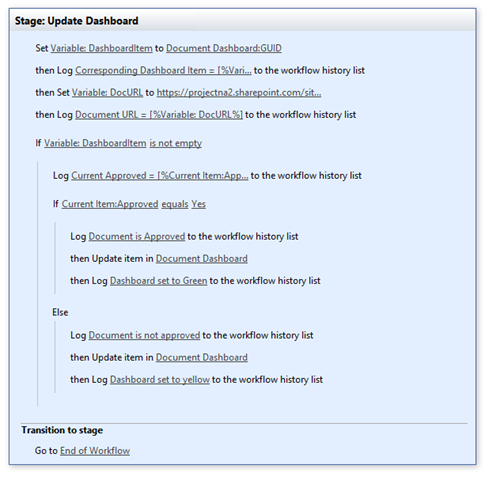 Adding Yammer to a workspace in 2013 is pretty simple. Basically, go to the site, add an App, and select the Yammer app from the SharePoint store. The main issue I see there is that I don’t believe it’s possible to programmatically provision a Yammer group for each Project site that is created. I’m not sure it’s possible at this juncture – but am relatively certain it’s in the roadmap. On the other hand, I’m not sure it would always be desirable to automatically provision a Yammer group for each site, as there may be some thought required on how to architect the Yammer network. As I’ll talk about a bit below, we would need to make the decision as to whether the group should be part of the internal corporate network, an externally accessible network – or even if we want to incorporate the project specific discussion into a larger group, for example, to support a program management model. After creating the new site and adding the Yammer App, you’ll be required to log in to Yammer and configure the Webpart. Logging in to Yammer with an existing account, I get the option to configure the Webpart. Connect to an existing Group. I’d submit that the most common configuration would be to simply create a Yammer group mapped to the site URL. In the case below, I create the Yammer group as a comment feed. …and within seconds have a discussion group created to support my Project. Note how this defaults to my internal organizational network, Project North America. Logging into Yammer.com directly, I can see a new group has been created for the site URL. The project team members may now collaborate and have conversations within Yammer, and I can see (and eventually search) the results within the SharePoint team site. 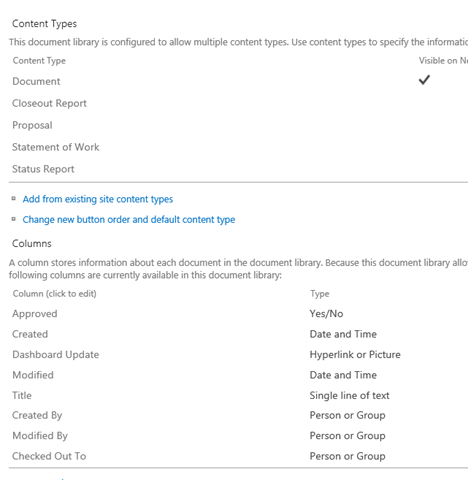 Users can also post documents to Yammer, which don’t get fed over to the SharePoint site, which presumably is also an issue on the ongoing roadmap for integration between the two products. The value of Yammer in this case is to 1) provide a useful collaboration platform and 2) to provide a central hub for team members involved in multiple projects and/or groups to collaborate – and then send the information back to the Project Site. What if I want to include external collaborators? In this case, I go into my Yammer administrative interface and create a new network. Below, see that I have created a network to support Project North America Collaboration. Once the network has been created, I can create groups within it and send invitations to anyone with an e-mail address. They would then receive an invitation to create a Yammer account (if they don’t already have one) and Bob’s your uncle, they’re collaborating on your project. The trick here is to create the group in an external network within Yammer – and then go configure the Yammer app on the project site. I have a project with both internal and external stakeholders. Rather than go through the efforts of getting access for my external stakeholders or creating an extranet site outside of my corporate firewall, I can use my project site for internal communication, and then provision a Yammer group to support external communication. I place carefully controlled documents on the Yammer site, such as policies, procedures, and content that would not be considered sensitive. I am supporting a joint venture project where we have multiple project sites, each one within the specific joint venture partner companies. 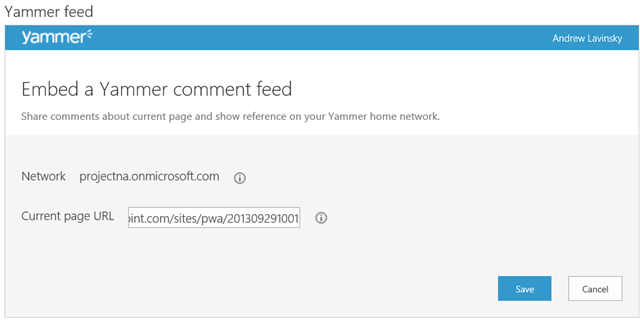 Yammer then provides the central collaboration to knit these sites together. Use Yammer to support program management. While each project will have a Yammer thread, I can review all of those in a consolidated perspective from the program management office. Use Yammer to support application management and integration functions. Many organizations struggle with Release Management, and with the interactions between multiple releases. 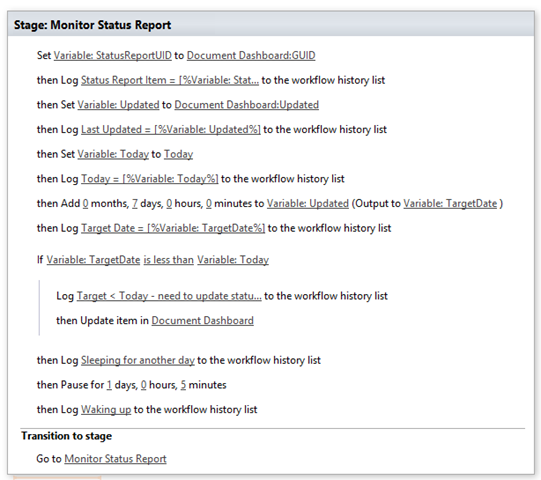 With Yammer, I could tag threads by application or environment, and informally use this to track activities that could impact system availability. Or imagine that I have an application specific discussion group for SAP, and surface that on the project page so that users are aware of upcoming application changes. In an oilfield management example, I could capture the equivalent of the daily operations call and making it available for team members to refer to. In the interest of being thorough, I figured I’d test out the possibility of adding two discussions to a Project site: one for internal discussions and one for external discussions. Turns out this is indeed possible. I’m not sure anyone would end up doing this, as it would seem to me that I would forget which discussion group I’m on and just post wherever I have my cursor. Still, a good thing to know. And again, once I start having multiple threads on a single page, I can use this to capture the daily signal traffic that I need to know to do my job, but that I don’t necessarily need to pay close attention to all of the time. Not sure what my conclusion is other than that you can definitely see the value right now, and you can definitely see the potential for value to be greatly increased through a tighter integration with SharePoint and Project Server. Stay tuned for most postings in this vein in coming quarters to periodically reassess specific project management use cases in the integration road map. Mark Everett, out of our Dallas office, sent me an e-mail the other day asking me why I haven’t posted anything about SharePoint 2010’s new calendar overlay functionality. Honestly, I hadn’t yet posted anything on the topic since it was the first I had heard that it even existed. …so I did some digging, and here you are….. 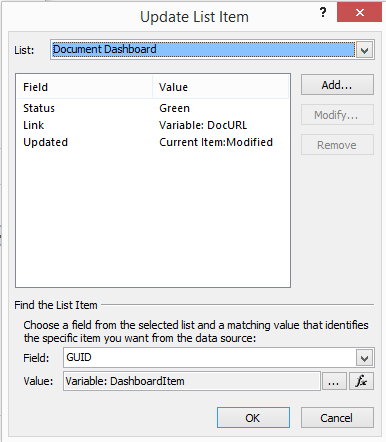 So it turns out that SharePoint 2010 has a new built in feature to aggregate up to 10 calendars into a single color-coded view. Apparently it’s a well known feature, but I apparently missed the memo. This is probably a pretty useful feature for PMOs or program managers who are looking for ways to aggregate multiple project calendars. If you’re not using project calendars, I point out that many of my clients actually use them quite heavily by e-mail enabling the calendar. 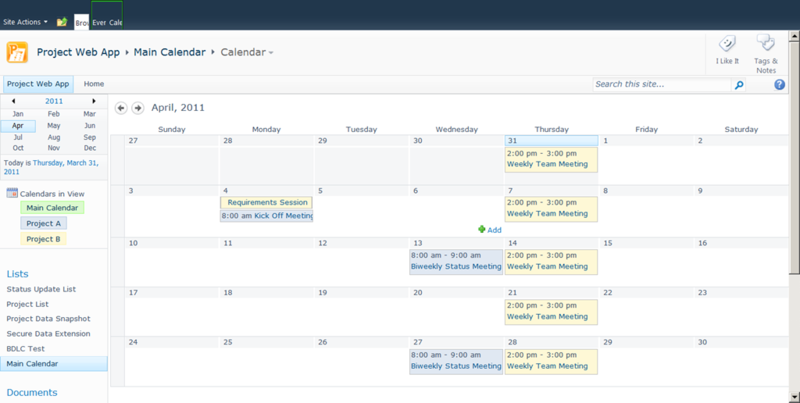 Once that’s done, the project calendar may be “invited” to project meetings just like a real person. 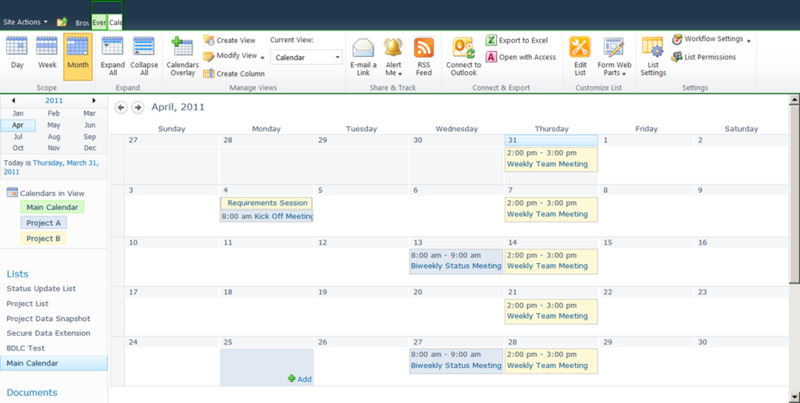 Any meeting invite will automatically get posted to the calendar, which in effect, works much like a project journal. This functionality puts all of the project meetings into a single calendar – useful when your PMO maintains visibility into all of the key project meetings. It’s actually surprisingly easy to create a new aggregated calendar. 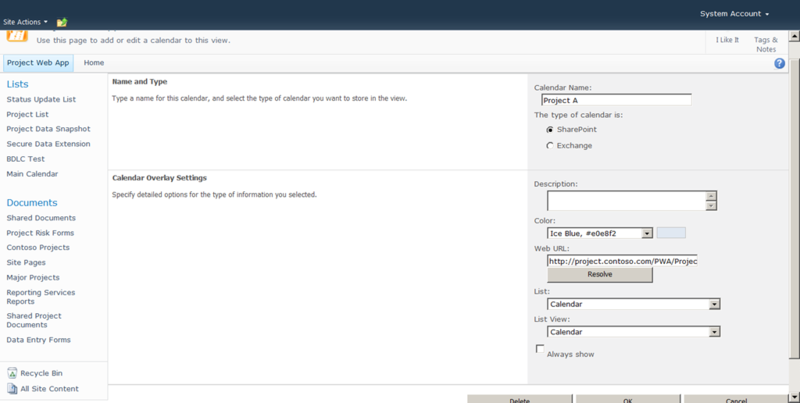 Just create a new calendar list within your SharePoint site. In this example, I will create one in the main PWA site. 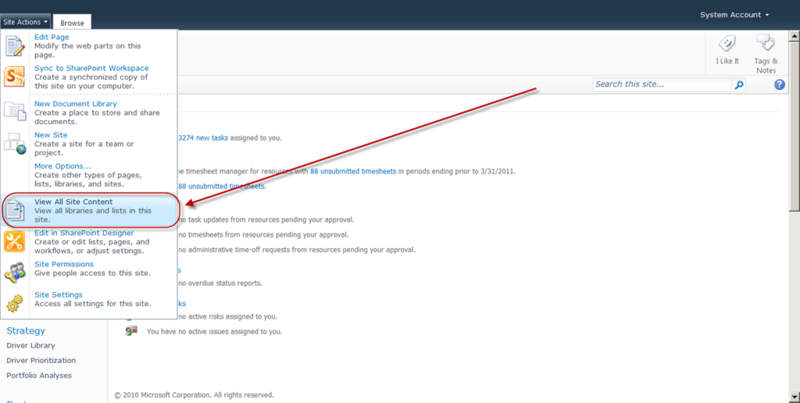 Click on the options to View All Site Content under the Site Actions menu in the top left. Once the calendar has been created. 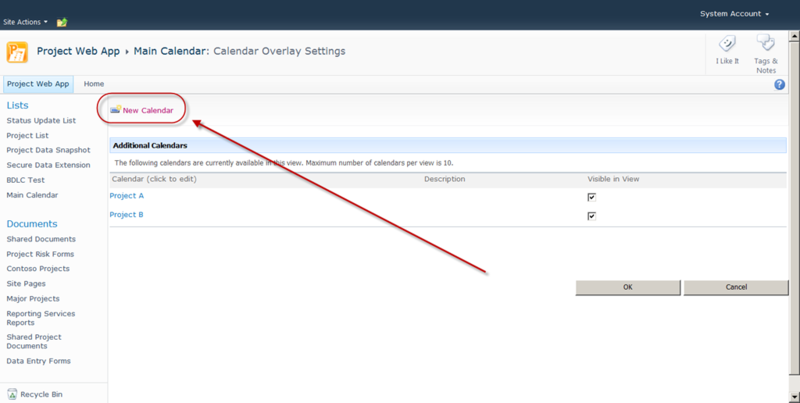 Choose the option in the Calendar tab to add a Calendar Overlay. Choose the option for a new calendar. 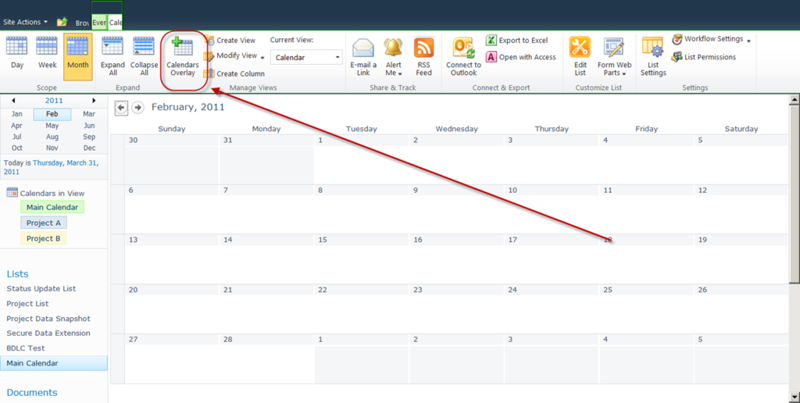 Configure the next screen to point to the target calendar. Choose a color, and you’re off to the races. 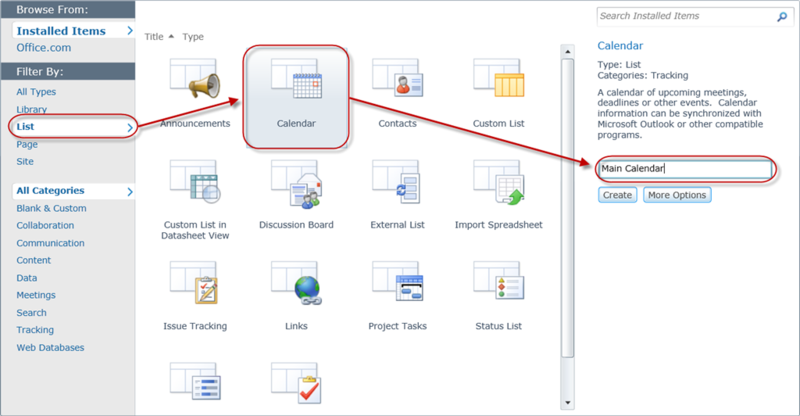 Note that you may change the default view to filter on specific meeting types such as status meetings or key phase gate meetings.